Not too long ago, it seemed as though anyone who could fill out an application, sign their name and lick a stamp could obtain credit. In fact, there was even a somewhat disparaging acronym associated with certain types of loans, which were reserved for borrowers who perhaps were not fully qualified to receive credit. These "NINJA" loans or "No Income No Job No Assets" loans helped create a large part of the housing strife the U.S. is experiencing today. As a result of these somewhat lax guidelines along with a generally difficult economic environment, many Americans have found themselves leveraged to the hilt with credit card debt and unable to make even the minimum payments on their credit cards. Here are some smart strategies to help you get your financial life back on track. I know, I may be too late with that advice. However, try to understand that if you act out of emotion, you are more likely to make a decision that will adversely affect your future financial situation. So instead, review your situation and formulate a plan when you have a cool head. Do not act when you are stressing out because there is too much month and not enough paycheck. Several years ago, our neighborhood had a giant garage sale which was a great opportunity for my wife and me to get rid of some of the stuff that accumulated in our house. As an added bonus, it was also an opportunity for us to line our pockets. If people only knew we would have given it away, but alas, people paid us to take our stuff! You may have a lot of "stuff" which you have amassed over time. This "stuff" may even be why you have credit card debt to begin with. Take an inventory of the things you could do without and look to sell. Don't let pride, the price you paid or some other foolish thought stop you from going down this path if it will truly help your situation. Craigslist, eBay or simply an old-fashioned garage sale may be your ticket to raising the cash you need to dig yourself out of debt. Many people who fall into financial problems deepen their problem by avoiding opening their mail or taking calls from creditors. Yes, if you are unable to pay your debt, a left hook from Mike Tyson may be more welcome than receiving a credit card statement or collection call. However, understand the credit card companies are in business to make money. If you avoid taking any action and do not pay or communicate with them, you are reducing your options. Make the calls. Explain your financial hardship. More than likely, the credit card companies can see your financial picture since they have access to your credit reports. The majority of credit card companies have hardship programs which vary in length and terms. Remember, the banks are trying to make a profit first and if they can't, they focus on trying not to lose money. There are programs which may forgive interest or significantly reduce the interest rate so that the company gets at least their principal back. Yes, the credit card carousel seems like a sensible alternative, but trust me, it's easy to slip up. 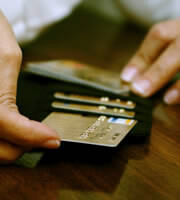 It is enticing to switch your balance from one card to another if the interest rate is lower. While this does make good financial sense, make sure you don't compound your problem and get deeper in debt because you run the old card back up. I would encourage you to employ this strategy only if, and this is a big if, you trust yourself not to treat the new line of credit as a license to spend even more. Payday loans may seem like a quick fix, but it's even easier to get trapped in a cycle of paying off the payday loan instead of paying your regular bills. If you let interest charges rack up, you'll quickly find yourself even deeper in debt. Credit problems are everywhere. You are not alone if you are experiencing a financial hardship. Contacting your creditors should be your first line of defense. If you are still unable to work out an arrangement with them to make payments, other options are available. Consider contacting a consumer credit counseling agency such as the National Foundation for Credit Counseling. These organizations may be able to work with your creditors on your behalf and enroll you in a debt management plan. A debt management plan may lower your monthly payments and allow you to make one payment to the agency who will then distribute your payment to your creditors. 0 Responses to "Can't pay your credit card bill? 6 action steps"